The Government in Britain has introduced a programme of savage welfare cuts. The cuts are part of a broad government offensive on worker’s living conditions with attacks on a whole range of benefits. The government’s programme of cuts is not just about reducing the amount the state spends on welfare, the aims is also to force the unemployed into taking jobs paying lower and lower wages which in turn drags down the wages of all workers. As part of the cuts programme the Government introduced the so called “Workfare” scheme under which the unemployed are forced to work for free for up to 6 months or face having their benefits stopped with no guarantee of a permanent job at the end. Needles to say companies were quick to take advantage of what amounted to free labour and began taking on an increasing numbers of people under the Workfare scheme. The government claimed that the Workfare would help unemployed find permanent jobs but as the number of people driven into working for nothing increased, it soon become clear that this was not happening. Workers taken on under workfare were not made permanent; rather, once their time under the scheme was finished,companies simply got rid of them and recruited a new set of workers from Workfare. After all why pay workers when you can get them for free!!! Further it soon become apparent that the Workfare scheme was actually increasing unemployment. Rather than fill new vacancies with paid workers companies began to take on unpaid workers under the Workfare scheme. There is also the concern that employers will begin to make workers redundant and replace them with unpaidworkers recruited under Workfare. Coupled to this is the reality that having a large pool of workers being forced to work for nothing acts as downward pressure on wages as a whole. Fear of being replaced by an unpaid worker puts pressure on workers not to demand a pay rise. This comes at time when the real value of workers pay in Britain is declining at a rate not seen since the 1930s depression. It is important to understand then that Workfare affects the whole of the working class not just unemployed. Since the workfare scheme was first announced there has been a general campaign against Workfare which the Solidarity Federation has supported. But we felt that campaign to a degree lacked direction. There was also the concern that it was to political in the sense that it focused too much on putting pressure on the government to drop Workfare. At the beginning of 2012 the Solidarity Federation decided to launch a more economically orientated campaign that would use the tactic of direct action to confront the companies who were actually making increased profits out of the Workfare scheme. Our strategy was to pick a specific company and then target them with coordinated nationwide pickets, communications blockades etc until they dropped out of the Workfare programme. We would then move onto another company and repeat the process. The hope is that we can force increasing numbers of companies to drop out creating a domino effect that will totally undermine and discredit the government’s Workfare scheme. By having a more focused campaign, directed at one company at a time, based on direct action, the Solidarity Federation hoped to also draw in other groups and individuals. The first company we decided to target for the campaign against Workfare was a company called Holland and Barrett. This company sells heath products and has shops in most towns and cities across Britain. We chose Holland and Barrett because of the extend they planned to make use of the Workfare scheme. At the beginning of 2012 Holland and Barrett had announced that they were to take on 1000 unpaid worker under the Workfare scheme. With a workforce of only around 3,500 people this would have amounted to almost a quarter of their staff on Workfare!! It was decided to launch the campaign against Workfare as part of the IWA Days of Action that took place in March earlier this year. The plan was to leaflet workerson the two days prior to holding a nationwide picket of Holland and Barrett shops on the March 31st. The day of action proved to be a tremendous success with pickets of Holland & Barrett and other companies using the workfare scheme taking place in over 20 town and cities across Britain. The pickets were not only supported by other anarchist but also claimants and anti-cuts groups. After March 31st the Solidarity Federation kept up the campaign with regular pickets of Holland & Barrett shops. This constant picketing put real pressure on Holland & Barrett, a company that tries to brand itself as “ethical and caring” on the basis that they sell heath products. As a result of the campaign the company received numerous complaints about their use of Workfare from angry shoppers with customers regularly bombarding their Twitter and Facebook accounts with complaints. The sustained pressure eventually proved too much and on July 5th Holland & Barrett declared a u-turn, their official facebook page announcing that: "the people currently undertaking the work experience scheme will be the last to complete the eight week placement. After this time Holland & Barrett will not participate further in that scheme." Holland & Barrett now intends to replace unpaid Workfare jobs with a salaried apprentice scheme. This announcement is another blow to the government Workfare scheme already under pressure as an increasing number of companies refuses to participate in the scheme for fear of bad publicity. The Solidarity Federation now hopes to build on this success of Holland & Barrett by now moving on to target another company.There has been some discussion about targeting Pizza Hut a company with a nationwide chain of outlets. But when the Solidarity Federation approached the company they responded by stating that they are no longer use the governments workfare scheme, a claim the Solidarity Federation is now investigating. If it proves true the SF will move on to target another company. 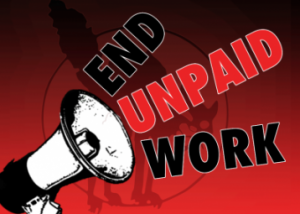 In the meantime the Solidarity Federation will continue to support the growing campaign against the Workfare until the scheme is scrapped and companies can no longer treat workers as unpaid slave labour.